One by one, New York City’s neighborhoods are being swept by an invasive species: affluent white people and the real estate developers who love them. And like so many invasive species, this one is more or less devastating the ecological relationships that preceded its arrival, spurring rapid displacements of natives and growing areas of monoculture. In Williamsburg, the process began a dizzying acceleration in 2005, when zoning rules were changed to open vast tracts of property to luxury residential construction. 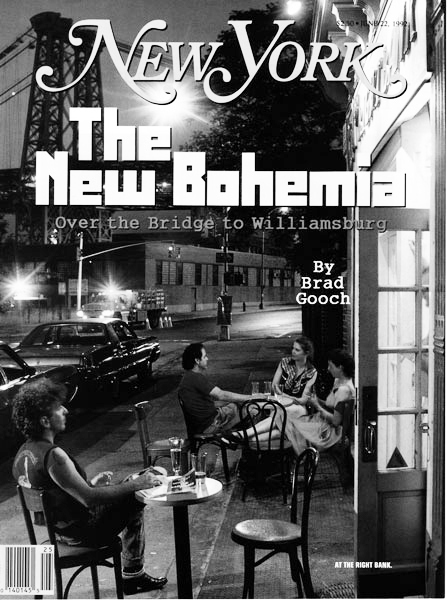 No longer anything like the place it was even ten years ago, Williamsburg is rapidly being reborn as Yuppie City. Now, finally, it’s become clear exactly what the ambiguous “Hipsters” were: spies and advance scouts for the yuppies, i.e. the Yuppie Avant-Garde. As the Corporate-Fascist State tightens its stranglehold on every institution in our lives, the Internet has been one of the few remaining outlets where information can flow freely, unhindered by gatekeepers, censors, and toll collectors. When mainstream corporate news media ignore or lie about vital news stories and issues, independent reporting on the Internet has been there to tell the other side of the story, to provide a voice to the marginalized, and a global forum for dissent, debate, and awareness-raising. No wonder the Corporate-Fascists want to change the level playing field of “net neutrality” and transform the Internet into another version of cable TV — one that they can fully control and monopolize. Well, now, the Federal Communication Commission, which regulates the Internet, is about to give the Corporate-Fascists exactly what they want — unless Americans raise hell. Stop the FCC from killing the last bastion of First Amendment free speech: See here, here, here, and here for more information, and see Bill Moyers below.